PRISMs to Power the UK. 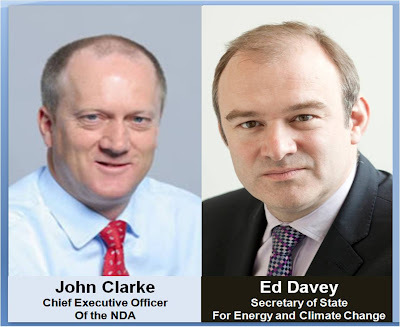 : Nuclear Decommissioning Authority (NDA): "...some things have gone wrong..."
Nuclear Decommissioning Authority (NDA): "...some things have gone wrong..."
How are thing's going at the NDA? Today's News & Star reports what the boss, John Clarke, has to tell us: Will the Americans continue to run Sellafield? "...its boss said that all options – including cancelling the remainder of the contract with Nuclear Management Partners – remained open..."
"...real disappointments” with the way Sellafield has been run by the consortium..."
"...he expected “to be further along than we are” but insisted the past four and a half years were not a total waste of taxpayers’ money..."
"...the NDA was criticised by MPs for continuing to shower millions in fees on the American-led consortium that manages Sellafield Limited..."
""...“We have been disappointed by some lack of progress and some things that have gone wrong.”...""
"...Its biggest challenge is dealing with the UK’s legacy of nuclear waste, which experts say will cost an estimated £67.5 billion to deal with..."
"...The consortium – .... – last year earned £54m in performance-related fees, but some of their profits will go to settle a £700,000 fine..."
"...Sellafield Ltd admitted breaching health and safety law.... Sellafield Ltd must also pay £72,635 in costs..."
Just do one thing right, Mr Clarke - make the no-brainer decision to accept GE Hitachi's ZERO-COST offer to use one of their PRISM reactors to burn our plutonium stockpile. It's costing us poor tax-payers £80 million a year to store and protect this stuff. GE Hitachi offer payments by results - if they don't succeed in burning the plutonium, we don't pay anything! Stop messing about and get the decision made! There's a gold star in it for you, from Mr Davey. Once into the process, this reactor renders the plutonium useless as a bomb making material and continues to generate enough electricity, from the fuel created, for 750,000 people for 50 or 60 years - emission-free! On it's own it's a decent contribution to Mr Davey's carbon targets. A fleet of them, configured as breeder reactors could burn our legacy waste as fuel - as your legacy waste problems reduce, we get clean, cheap electricity. Labels: DECC, Ed Davey, emission-free, John Clarke, NDA, News & Star, Nuclear Decommissioning Authority, Nuclear Management Partners, plutonium stockpile, Sellafield, Sellafield Ltd.